OAKLAND -- The Thunder’s three-point defense has struggled over the past few weeks, even during the midst of the team’s eight-game winning streak, not just during this current four game losing skid. In fact, the Thunder has allowed 12.3 made three-pointers per game over the last 10 contests, and now it has to contend with perhaps the most talented three-point shooting team the NBA has to offer – the Golden State Warriors. With Stephen Curry, Klay Thompson and Kevin Durant are all shooting above 41 percent on three-pointers this season, and attempt a combined 23.5 per game. The Thunder’s first job in protecting the line is to show a wall of defenders to stop fast breaks from happening. Next, the Thunder has to be strong in containing the ball at the point of attack and then getting out to contest shots off of Warriors passes. 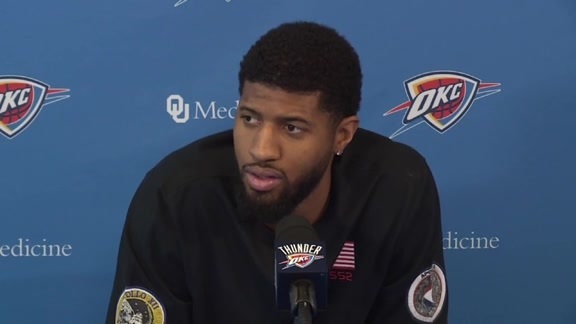 “If we just get back to our principles — helping one another, being loaded and having an awareness that guys are gonna constantly move — I think defensively our numbers will go back up,” forward Paul George added. Those close outs that the Thunder will have to repeatedly make throughout the game against Golden State must be done accurately and consistently in order to throw off shooters’ rhythm. If the Thunder allows the Warriors to just catch and shoot from behind the arc, it could be a long night. Having the trust that the defense behind the action will be there to help prevent layups is critical to players feeling comfortable flying out to deter a shot. From there, the defender has to get back into the play and catch up to the way the rest of the team is rotating. “You’re not gonna stop teams from necessarily shooting 3-point shots, but we do try to do is break rhythm,” Donovan noted. The effect of Andre Roberson’s season-ending injury didn’t show up right away, but it’s starting to become clear over the past few games. This is another bout of adversity for the Thunder, and a chance for team leaders to show the way to younger guys like Terrance Ferguson, who has been in the starting lineup since the injury occurred, though Donovan disclosed on Monday that he wasn’t sure who would be in the starting lineup against the Warriors. 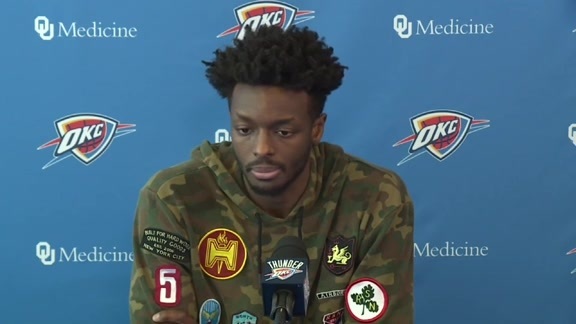 - If Ferguson doesn’t end up starting, one of the many options at Billy Donovan’s disposal is forward Jerami Grant, who has been playing small forward, power forward and center at times this season. The Swiss Army knife has picked up a new tool as well, driving the ball to score at the rim and draw fouls. In particular, Grant has seized opportunities to drive baseline and finish above defenders at the rim. “One of the things he’s doing is sometimes when these teams maybe close a little bit shorter to him to contain him, he’s doing a good job of taking up space and driving the ball, changing directions,” Donovan described. - Something else that Grant has done at a high level is take charges while defending the ballhandler. A large percentage of charges get drawn by helpside defenders who come over into the lane and plant their feet. Grant’s are different. While defending ballhandlers the rangy forward has done a great job of moving his feet in tune with his assignment, squaring his chest up and taking on the contact. Grant has racked up 10 charges drawn this season, tied for 16th most in the NBA, even while playing just 20.2 minutes per game. - Another way that Thunder players are sacrificing their bodies for the team is by setting screens. Steven Adams is the resident expert on that aspect of the game, and his work with Russell Westbrook has become near machine-like. He’s also continuing to develop chemistry with Paul George, who has found a rhythm coming off Adams screens and firing jump shots from the elbow. Adams ranks third in the NBA with 4.9 screen assists per game.